Donald Trump's tax cuts are already paying dividends... well, actually the companies that are benefiting from the Tax Cuts and Jobs Act passed by the Trump Administration in December are not only returning cash to shareholders in the form of dividends, but are presiding over what could be the largest share buyback program in history. The legislation slashed the corporate tax rate from 35% to 21% and the top individual tax rate shrunk to 37%. It also cut income tax rates, doubled the standard deduction and eliminated personal exemptions. All told, the Trump tax cuts are the eighth largest since 1918, and represent just over 1% of GDP – in other words, how much federal revenue the government will forego as a percentage of the economy. Suddenly US companies have found themselves flush with cash, and they need to find a way to spend it. The options are typically to plough funds back into the company via capital expenditures like new buildings, products or equipment. Or, distribute the money back to shareholders in the form of dividends, or through share buybacks which don't obviously go directly to shareholders, but reduce the number of outstanding shares, thereby making the share float less diluted. S&P 500 firms are reportedly on track to give $1 trillion in either dividends or share buybacks to shareholders this year, based on the lower corporate tax rate, incentives to repatriate overseas cash and strong earnings. Goldman Sachs estimates share buybacks will jump to $650 billion while JP Morgan predicts they could run as high as $800 billion. 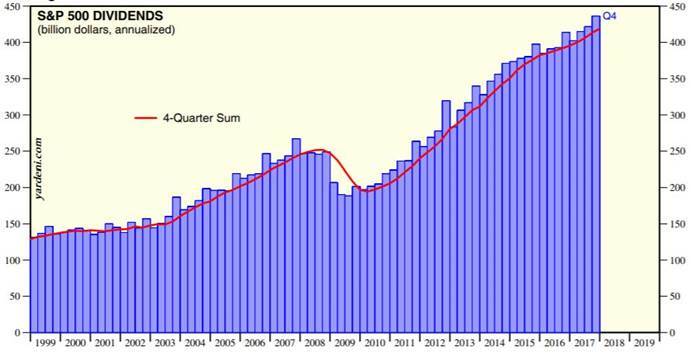 Either estimate would far exceed the $530 billion in share buybacks recorded in 2017. Goldman also sees dividends expanding to $515 billion. According to the Financial Times, companies have announced a record $187 billion in share buybacks so far this year; Trim Tabs Research reported $113.4 billion in February alone, a three-year high. Share buybacks are a relatively new phenomenon. For most of the 20th century they were illegal because they were considered to be a form of stock market manipulation. But that all changed in 1982 when the SEC legalized them. Since then buybacks have been a popular tool for management to stuff cash back into the company, indirectly, by reducing the share float. Purchasing company stock generally inflates the share price and boosts earnings per share – a key metric on which CEO bonuses are calculated. After the SEC changed the rules to allow buybacks, hundreds of companies starting using them, especially when it was shown in a 1985 Fortune article that shareholders in buyback companies earned better returns than the S&P 500 index – 22.6% versus 14.1% Bloomberg points out in a primer on buybacks and dividends. In 1997 buybacks surpassed dividends as the main way companies redistribute funds to investors. The question is, are share buybacks good or bad for shareholders? The answer is, in your authors opinion cut and dried, the one positive does not outweigh the many negatives. On the positive side of the ledger, reducing a company’s outstanding shares makes each dollar of earnings more valuable on a per share basis, which is good for investors. Another thought to be plus for shareholders: corporate executives seemingly know how much their company is worth so if they are buying back shares, it's a signal that the stock is undervalued – otherwise, why would they buy high? Bloomberg states that buybacks can contribute to bull markets, noting that in some years, shares bought in buybacks outnumbered shares purchased by mutual funds by 6 to 1. Really though, the most insightful thing to say about share buybacks is that they're good for management, not necessarily shareholders. Buybacks make it easier for executives to hit targets by reducing the number of shares. Management receives compensation - usually in the form of stock options - that is tied to the company's stock price. The higher the stock price the more they make cashing out their options. When a stock buyback occurs the short term implications on the stock price are positive. If a company’s stock is suffering from low financial ratios ie earnings per share (EPS) and price earnings ratio (PE), buying back stock can give the company a temporary boost because the ratios are based on the number of outstanding shares. Earnings don’t change but the EPS looks better because the firm has reduced the number of shares outstanding, so management meets goals for profit growth and earn bigger bonuses. There are plenty of negatives to share buybacks, with the most obvious being that buying back shares means that executives are foregoing the opportunity to put that extra cash back into the business instead, which could potentially grow the company long term. Recent studies have linked increased spending on buybacks to decreased corporate investment – such as expansion plans, more hiring or raises. Buybacks have been used as a punching bag for Democrats in particular who argue that buybacks enrich companies and wealthy shareholders at the expense of workers. Timing the buyback is important. Companies have been criticized for buying shares too high, actually leaving shareholders worse off. Investors will also fail to benefit after a stock buyback program has been undertaken if companies do not reduce their share count because they have issued new stock to replace employee stock options. Stock buybacks are almost always initiated in good times – when stock prices are high. Stock buybacks do not happen in bad times when stock prices are low. Purchasing stock at inflated prices, paying a dollar for 50 cents worth of stock, is not an effective use of cash; some companies borrow money to pay for their stock buyback programs. 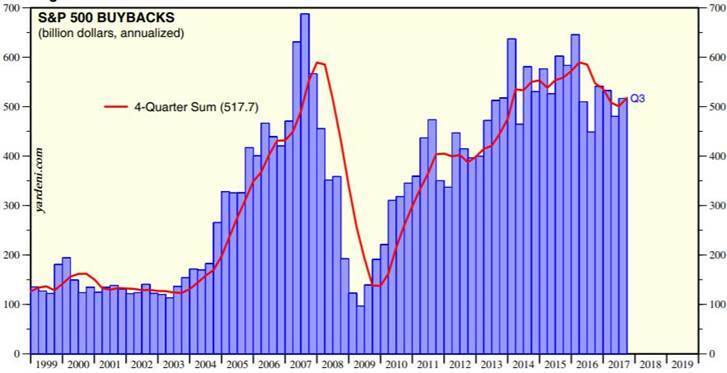 According to Bloomberg, the all-time high in buyback activity was in the lead-up to the financial crisis of 2008, certainly the worst time in recent memory to be buying stocks. By now we can see the pros and cons of buybacks (mostly cons, unless you're in management), but what about dividends? Here too there are negatives and positives, but on the whole, dividends offer much better value for shareholders, in my opinion. On the downside, dividends may work against the stock price of a company by reducing the book value of the stock. Also, managers do not immediately benefit from dividends as their options do not qualify for dividend payments. Stock buyback programs can be cancelled and most investors would not notice, while dividend payments are highly visible to shareholders and cutting or eliminating a payment creates warning signals something is amiss. Knowing what we now know, in regards to current stock buyback programs, is it any wonder that managers prefer stock buybacks as opposed to special one-time dividends, starting or increasing existing dividends? Each company's share buyback program will have to be individually judged by their shareholders as to its worth – but perhaps existing shareholders and potential investors had better take a hard look at just what is happening. Remember to check option grants and insider selling while doing your due diligence and making your mind up regarding stock buybacks versus dividends or reinvestment. 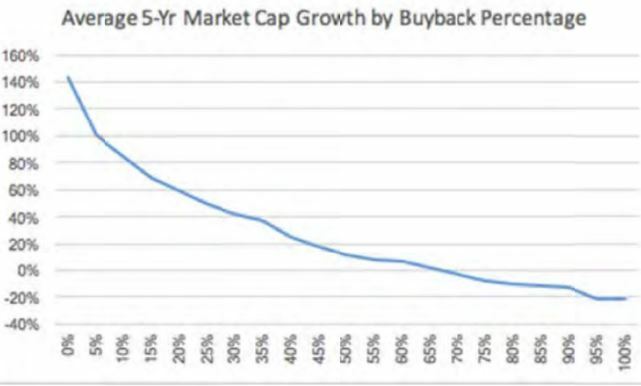 The bottom line is that share buybacks usually do nothing to create long term shareholder value and are never a match for a steady, and sustainable, dividend. There are many studies, easily accessible online, that have shown that the companies with the most consistent, and quickly rising dividends have greatly outperformed the overall market. For those in search of appreciating retirement income streams, or income in bear markets and times of uncertainty, dividend-paying stocks – companies returning “excess” cash to shareholders in the most beneficial manner - should be on every investor's radar screen.